Custom made pump panels utilizing ECM pump motors to distribute to the various zones. 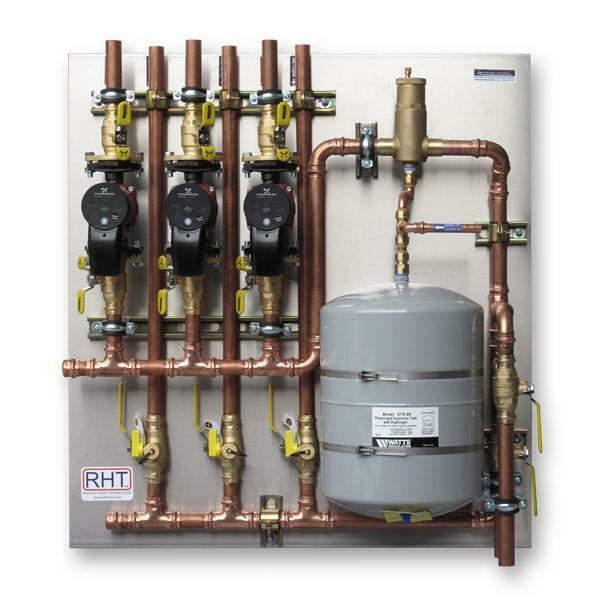 This is a cost effective and time savings means of creating a large scale hydronic system with multiple zones. Designed around the Arctic Heat Pump, each pump controls a zone operating on constant speed pressure differential adjusting the flow rate as needed. Comes complete with 1 ¼-1 ½” main line and 1” zone lines. 2-8 zones can be added. Optional Heat Pump cooling zone includes 3-way valve, Hydronic separator and additional cooling pump.